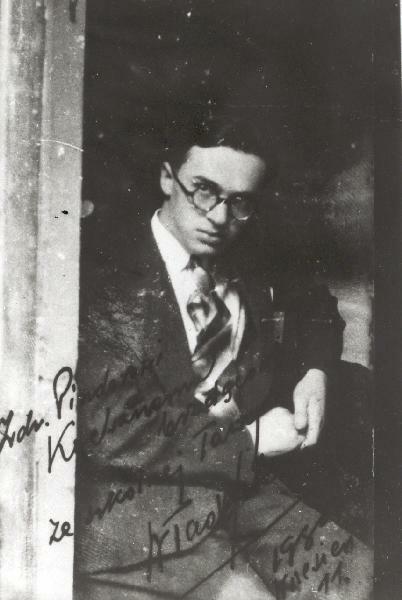 Excerpts from "A Page from the Deportation Diary"
Władysław Szlengel (1912-1943) was a Jewish-Polish poet, lyricist, journalist, and stage actor who was murdered by Nazis during the Holocaust. For more information about Wladyslaw Szlengel and the role his courageous friend Dr. Janusz Korczak played in befriending, watching over and comforting children sent to their deaths by the Nazis, please read the article beneath the poem and follow the links. leading the children, at the head of the line. They were dressed in their best clothes—immaculate, if gray. Some say the weather wasn’t dismal, but fine. but if they’d been soiled, tell me—who could complain? five by five, in a whipping rain. through barely cracked windows—pale, transfixed with dread. a strange moan escaped, like a sea gull’s torn cry. Their “superiors” looked on, their eyes hard as stone. So let us not flinch, as they march on, to die. Footfall . . . then silence . . . the cadence of feet . . .
O, who can console them, their last mile so drear? The church bells peal on, over shocked Leszno Street. Will Jesus Christ save them? The high bells career. No, God will not save them. Nor you, friend, nor I. But let us not flinch, as they march on, to die. No one will offer the price of their freedom. No one will proffer a single word. At the town square there is no intervention. reeks with the odor of vodka, and lies. Gut Doktor Korczak, please keep them from harm! his choice is to end with them. Translator's note: It seems incomprehensible that the Nazis murdered completely innocent women and children, and that the German people stood by and did nothing to stop them. But what if I told you that today the governments of Israel and the United States have colluded to do something very similar, so that millions of Palestinian children have been born in chains, and tens of thousands of them have died without ever drawing a free breath? What if I told you that the President of the United States, his cabinet, the State Department and the Joint Chiefs of Staff all know exactly what is happening, and yet none of them will do anything to help these destitute children, because to admit the truth would cost American politicians campaign contributions and votes? How would it make you feel to know that Americans have been funding and supporting this new Holocaust, to the tune of hundreds of billions of dollars, over the past fifty years? If you are an American citizen, doesn't this make you complicit, to some degree, in what is happening to these poor children, who have never done anything to harm you, or anyone else? If this concerns you, as I hope it does, I have put together an index of articles about this new Holocaust, the Nakba ("Catastrophe") of the children of Gaza and Occupied Palestine. In this index you can read what great humanitarians and Nobel Prize laureates like Gandhi, Albert Einstein, Dr. Martin Luther King Jr., Jimmy Carter, Nelson Mandela and Desmond Tutu have said about human rights and the Nakba. I don't believe the United States should do anything to deny completely innocent women and children equal human rights, freedom and dignity. Do you? I hope you will choose to follow in the footsteps of Janusz Korczak and join me and millions of other people in trying to help the children of the Nakba become free, just as American children are free. And I believe there is something we can do to help. To learn more, please click here: Peace in the Middle East. Wladyslaw Szlengel was born in 1914, in Warsaw. His father, an artist-painter, supported his family by painting movie posters. Wladyslaw, while still in school, wrote poems and short stories. A number of them were published in various small magazines. Later, his works continued to appear, mainly in Warsaw publications. He also was a songwriter and produced texts for cabarets. He also wrote satiric poems for the press and stage. Three fir trees grow there. Not even for a million. and let us die a swift death! Szlengel took part in the September of 1939 campaign against the German invaders. The only Jewish writer who was still alive in the ghetto, he became its chronicler. According to surviving evidence, Szlengel was a close friend of Janusz Korczak. Szlengel was killed in April 1943. He is known to have been in a bunker during the Warsaw ghetto uprising, but the circumstances and the exact date of his death are not known.